Has it ever been as tough to sell a property in Spain as it is today? Demand for property is at rock bottom and the number of properties on the market is at levels never seen before. The traditional route of simply listing your property with an estate agent and waiting for them to find you a buyer quickly just doesn't exist today. There is just too much stock of properties and too little demand for it. Today if you really are serious about selling up then you have to take matters into your own hands. If you list your property with an estate agent, unless it's a really special property, it will just be one of hundreds or thousands on their books. Chances are they're not going to get it sold any time soon. For the past five years, Eye on Spain has successfully helped many sellers get their properties sold by getting them listed for sale on the website here. It's time to take control of the sale of your property and you can start today by advertising it on Eye on Spain right now for a one-off cost of just 97 Euros. Your property remains on the site until it's sold! 1If you have your photos ready on your PC to upload you can have your listing up and running in just 10 minutes. 2No commission to pay! Estate agents will typically add 3 - 5% to the price of your property for their commission. You therefore advertise your property at a lower price and make it more competitive for a potential buyer. 3All enquiries are sent directly to you and you can control exactly how they are dealt with. No middlemen to mess things up...or sell another property to your potential buyer! 4Edit your listing at any time. Change photos, description or price whenever you want in the easy to use control panel. 5An average of 10,000 people visit Eye on Spain every day, many searching for property...possibly YOUR property. 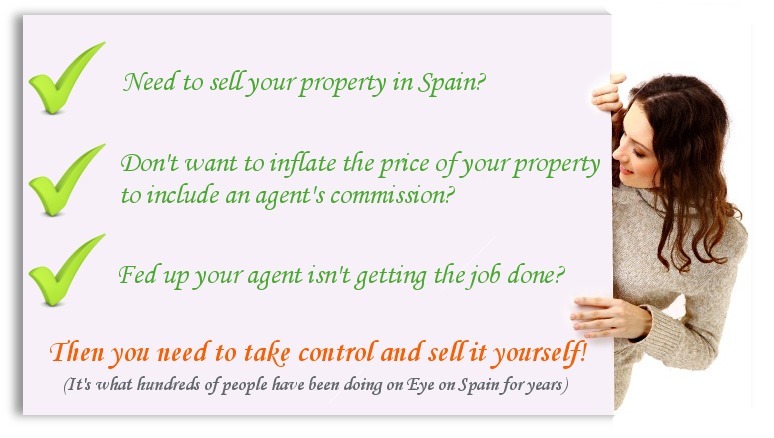 6Your property will remain listed on Eye on Spain until it's sold or you cancel your listing! There are no recurring fees whatsoever.